It’s been a history-making year for BTS, the K-pop sensation that has made ripples around the globe with its recent US debut and everything in between. 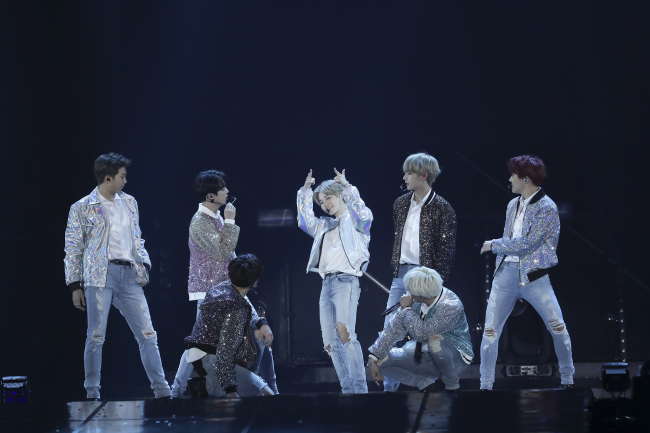 Having left footsteps across several continents with its “Wings” world tour that kicked off in Seoul in February, BTS finally returned home to wrap up its monthslong global journey in Seoul at Gocheok Skydome on Sunday. And the ever-growing K-pop act expressed its ambition to enter top 10 on the Billboard Hot 100 and debut at No. 1 on Billboard 200 in the future. “With our previous album, we’ve scored No. 7 on the Billboard 200 and our recent ‘Mic Drop’ has debuted at No. 28 on the Hot 100 chart. And now, we hope to score No. 1 on Billboard 200 and enter the top 10 on the Hot 100 chart,” said Jimin during a press conference for the “2017 Live Trilogy Episode III The Wings Tour The Final” in Seoul on Sunday. “So many things have happened this year. From our ‘Wings’ tour that started in February to our Billboard Music Awards performance in May and our latest performance at the American Music Awards, behind all of our achievements were our fans. Rather than one particular moment, so many things are imprinted in our head,” said Jungkook. Jin also shared his ambition for next year, saying he hopes to tour around stadiums. The history-making boy band made its US debut at the American Music Awards and appeared on high-profile TV shows such as “Jimmy Kimmel Live!” and “The Ellen Degeneres Show.” Most recently, BTS’ Japanese single “Mic Drop/DNA/Crystal Snow” claimed the No. 1 spot on Japan’s Oricon singles chart. Living up to the group’s fame, “With Seoul,” a free song to promote Seoul released last week, crashed the city’s official tourism website. The group’s bag is overflowing with trophies and global media are referring to BTS as world-dominating, but BTS said it now sees a greater responsibility to keep its pace and identity amid the whirlwind of attention. “We try to take responsibility and avoid taking strategic steps even though we are on people’s attention,” said RM. Kicking off with its Seoul leg of the “Wings” tour in February, BTS has roamed all around, visiting Chile, Brazil, the US, Thailand, Indonesia, Japan, Taiwan and Hong Kong. But RM said BTS has more in store for its global promotions. “We are now working on our next album and we will continue our ‘Love Yourself’ series. 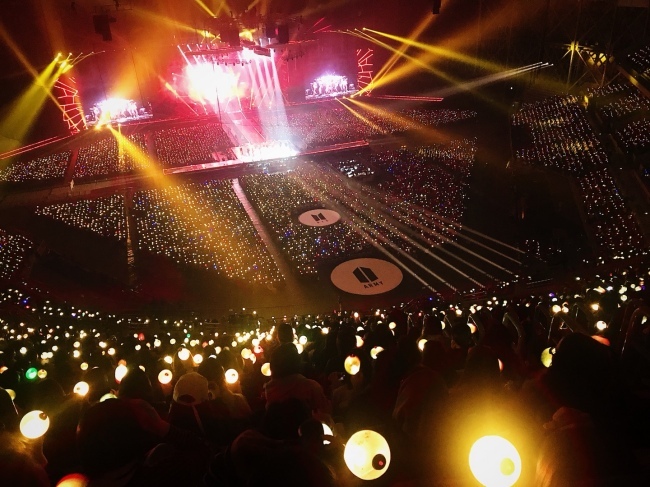 And we plan to visit the (global BTS fandom) Army all over the world with another tour,” RM said. Bang Si-hyuk, CEO of the group’s label Big Hit Entertainment, also attended the Sunday press event and shared his thoughts about BTS’ recent US debut, expressing his hopes for the group to pave the way for K-pop artists to make inroads in Western pop culture. Calling 2017 a dynamic, epic year all over the world, Bang said he now hopes BTS can propel K-pop genre to carve out its place in the US. “Many have asked what was behind BTS’ success, but I think it’s still too early to say that the group has made a major success. But what I can confidently say is that we will continue protecting BTS and K-pop’s original values,” said Bang. 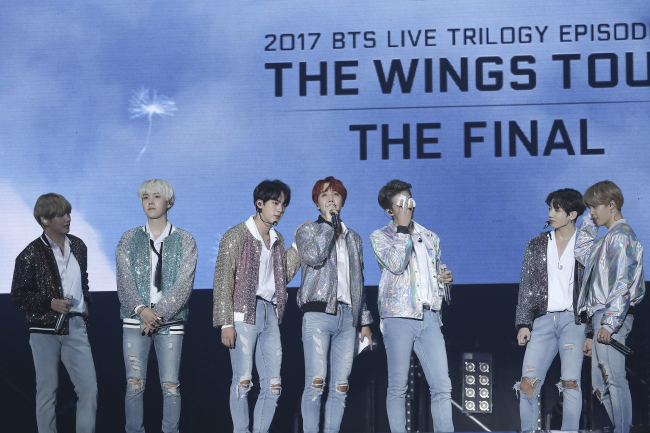 BTS wrapped up its three-day “Wings” concert series on Sunday at Gocheok Skydome in Seoul, drawing more than 60,000 concertgoers.